LOT Publications Webshop. Transformation in Dutch Turkish Subordination? Transformation in Dutch Turkish Subordination? Since language is a dynamic entity, language change is inevitable, and nowhere more so than in contact settings. When people habitually use two or more languages at the same time, the languages influence each other in many ways (syntactically, semantically, phonetically or morphologically). 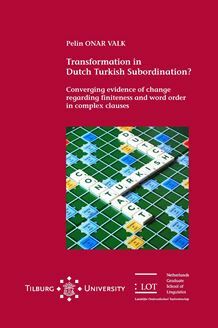 This book investigates contact-induced structural change in immigrant Turkish spoken in the Netherlands, with a focus on the domain of subordination. The study emphasizes the value of finding converging evidence. Experimental and conversational data were collected from participants in the Netherlands, and these were compared to similar data from similar participants in Turkey. Furthermore, the bilingual data were collected in monolingual and in bilingual speech modes. Turkish tends to employ non-finite subordinate clauses that canonically precede the matrix verb (reflecting verb-final word order), while the corresponding clauses in Dutch are finite and follow the matrix verb (employing verb-medial order). Bilinguals preferred forming Turkish subordinate clauses with the Dutch-like characteristics: finite and verb-medial. However, they found the conventional subordinate structures just as acceptable as people in Turkey did. The conclusion is that these conventional structures still occupy a strong position in the mental grammars of these speakers although they do not use them much in actual speech. Surprisingly, whether the participants were in monolingual or bilingual mode did not matter much. As one of the first systematic syntactic studies of this relatively young contact setting, this work shows that ‘change’ is going on in Dutch Turkish. The findings contribute to our knowledge of how languages change. Data from the various methods converged, but not completely, suggesting that language change is a complex phenomenon.